Nishiki Market is Kyoto's best-known market for all things food and Kyoto related. Here you can find plenty of sweet and savory souvenirs and snacks to enjoy. Let us introduce to Kyoto's kitchen and the things you must try there! Nishiki Market is also known as "Kyoto's Kitchen". Every day locals and visitors stroll along the narrow street lined with shops selling local food, crafts, and souvenirs. In this article, we will introduce you to the charm of Nishiki Market in Kyoto as well as ten delicacies to try when you visit. Nishiki Ichiba, or Nishiki Market, is a shopping street located between Karasumaru and Kawaramachi. For the locals, it has always been a regular shopping spot but over the years has become more and more popular with visitors as well. Nishiki Market originally started out as fishmarket. Nowadays it hosts a little bit of everything Kyoto has to offer if in terms of food, arts, and crafts. If you don't have much time to pick up food and souvenirs in Kyoto, this is a great place to do both at the same time. At Nishiki Market, you find many delicacies and souvenirs made in Kyoto. Most of the food items are meant to be street food and freshly prepared in the shop. At nearly all the shops you will find a sign telling you to refrain from eating while walking. It is still seen as a bad custom in Japan to do so, even though many places are not that strict about it anymore these days. Don't worry, you are welcome to eat in front of the shops and some shops even have places to eat in. Nishiki Market is mainly known for having a great variety of food, snacks, and drinks. We choose ten things you might want to try when visiting. Kitaoshoji is a shop which specifies in bean snacks, especially black soybeans. They have two different restaurants in Kyoto and recently gained big popularity for their matcha and warabi mochi (bracken starch mochi) set. You grind the black soybean powder to top the warabi mochi yourself at the table. A truly fun and delicious activity with friends and family. If you crave for something more than a light snack we highly recommend trying their Black Soybean Gozen set (1234 yen including tax). It consists of rice, miso soup, natto tempura, silken tofu, boiled beans and small sardines with Japanese pepper. All of the dishes contain black soybean giving it a unique flavor experience. When you stroll the streets of Nishiki market you will most likely see small, suspiciously round looking, bright red octopus. They are one of the most popular snacks at Nishiki Market known as Tako Tamago. Tako Tamago is little glazed and grilled octopus stuffed with a quail egg. Many people really enjoy the mixture of flavors and textures. Are you brave enough to try it? Located in the heart of Nishiki Market is a small mentaiko (spiced pollock roe) shop offering all kind of dishes made with the bright red fish eggs. You can choose from a huge variety of mentaiko to take out as well as snacks and dishes to eat inside the shop. Ramen with mentaiko topping, mentaiko mayonnaise topped fried chicken and mentaiko filled steamed buns are just some of the options. We braved the most unique of the selection, mentaiko soft serve ice cream (500 yen including tax). The ice cream base is very creamy and rich and the spicy mentaiko lends it an interesting edge. Be aware that this one is fully mentaiko flavored and only suitable for true mentaiko lovers but it is unique without a doubt. KYOTO BEANS CONFECTIONERIES is known for coated beans in a variety of flavors, a traditional Japanese snack. If you are not sure which flavor to get you can try all the flavors in the shop beforehand. You can either buy them prepackaged or fill a cup with a mixture of your favorites. If your crave unique ice cream but aren't adventurous enough for mentaiko ice cream, KYOTO BEANS CONFECTIONERIES at Nishiki market also sells soy milk black bean flour ice cream and tofu ice cream (both 380 yen including tax). The soy milk black bean flour ice cream is made without dairy or eggs and completely vegan. The staff couldn't confirm if the waffle cone is vegan, so maybe you should just eat the ice cream and expose of the cone if you are vegan. Unfortunately, they don't offer cups at the moment. Konnamonjya at Nishiki Market is owned by Kyoto Tofu Fujino, a soymilk manufacturer known for their unique and delicious inventions. Their soymilk doughnuts (six pieces 300 yen including tax) are their best selling item. They offer a healthy twist on the popular snack and are freshly made to order. They are not too sweet, slightly crunchy on the outside and fluffy and light on the inside. Another popular item is their soymilk ice cream (includes dairy) which is available in plain (300 yen including tax), matcha (400 yen including tax) and plain and matcha mix (350 yen including tax). They also offer savory items if you prefer something that isn't sweet. Their yuba (tofu skin) sashimi is a great healthy and vegan choice at Nishiki market. If you have a dog at home, how about getting some soy milk dog treats for them as well? Why always just bringing souvenirs for the two-legged family? Warabi mochi are usually covered in roasted soy flour known as kinako. At Sawawa everything is made with matcha and their most popular item is the matcha warabi mochi. you can either buy them in a small cup or a bigger box. They can be eaten right away or kept for one or two days. As you can see from this picture obove it is better to eat them as soon as possible. They are still delicious the next day but the longer you keep them the more the matcha gets saturated by the moisture of the mochi. If you love matcha you might want to take a look around as there are many treats made with fresh matcha that last for a couple of weeks or even month such as cookies or castella cake. Of course, you can also buy fresh matcha powder at Sawawa. You can buy senbei (rice cracker) all over Japan but shops selling them fresh are rather rare. You can choose between soft and hard crackers as well as from many different flavors. The crackers are between 100 and 200 yen a piece. This might seem a little bit expensive if you can get a bag of rice cracker for the same price. However, once you tried fresh rice crackers you will definitely see the difference and you might not want to eat normal bagged rice crackers ever again. Numerous shops at Nishiki Market sell tsukemono, or Japanese pickles, which are traditionally enjoyed with rice or to accent other Japanese cuisines. Tsukemono is not rare in Japan but the choice at Nishiki Market is huge. 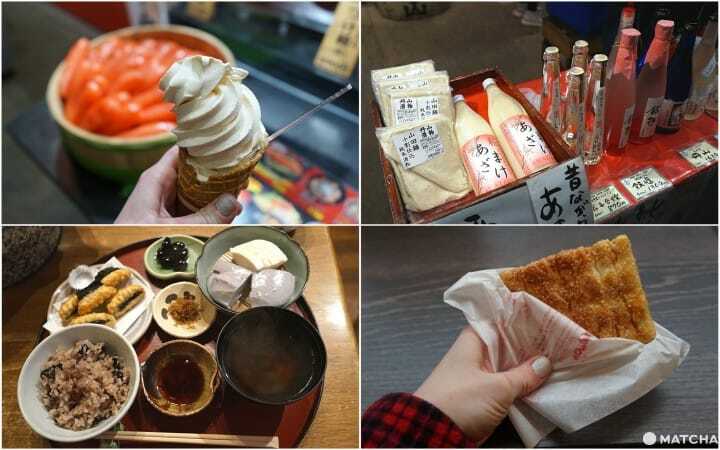 Most of the tsukemono are made with local ingredients and many shops will let you taste test some of them, so you get an idea of what they taste like. If you like pickles you should definitely give tsukemono a try! There are a couple of shops at Nishiki Market that sell traditional sake and amazake (sweet non- alcoholic drink made from fermented rice). Some shops will even let you taste test or sell the sake by the cup so you can have a better idea of what kind of sake you want to get for yourself or as a souvenir. Yamadashi doesn't offer the possibility to drink their delicious green tea right away but its aroma is well worth the wait until you get home or to your hotel room. They offer fresh loose leaf green teas in every variation possible. The green tea roaster is located in the shop so the delicious smell wafts through the air long before you reach the shop. The price depends on type and weight but each is under 1000 yen for the least amount which is between 100 and 200 gram. With all the different versions it might be hard to figure out what's the difference. Don't worry you can ask them for an English menu which explains every single tea. Nishiki Tenmangu Shrine is located at the east end of Nishiki Market. The shrine is dedicated to the Shinto god of learning. At this small shrine, you can get some very unique omamori (good luck charms). The one you see above is for the health and safety of your pet and they can be attached to their collar. Another cute omamori shows hello kitty holding a koi carp and being dressed up as one as well. These are meant to help you find love. The koi is a word game because koi is also short for Koibito, or lover. This particular koi is also known as a Nishiki Koi which is a nod to the name of the area the shrine is located in. If you search for souvenirs or want to try some unique and delicious Japanese cuisine Nishiki Market is a great one-stop destination. Here you can get authentic snacks, peculiar goods, and beautiful Kyoto ceramic and glassware. One visit can cover all the souvenirs for friends and family and fill your belly with delicious food at the same time. Why not drop in on your next visit to Kyoto? Stroll The Streets Of Kyoto In Search Of Gion Komori's Warabimochi!